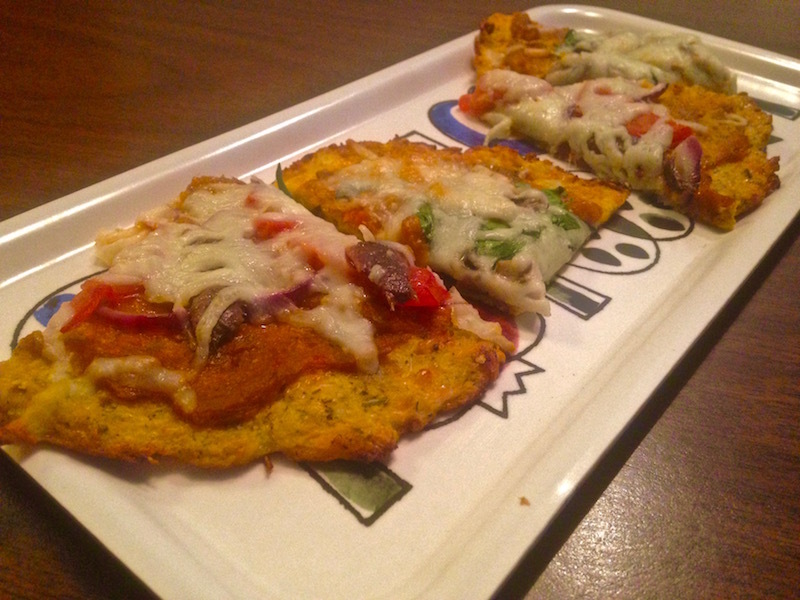 This Cauliflower-Crust Pizza is LOW-CARB. And HEALTHY. And AMAZING. | Keep It Up, David! Yes, folks, it can be done! 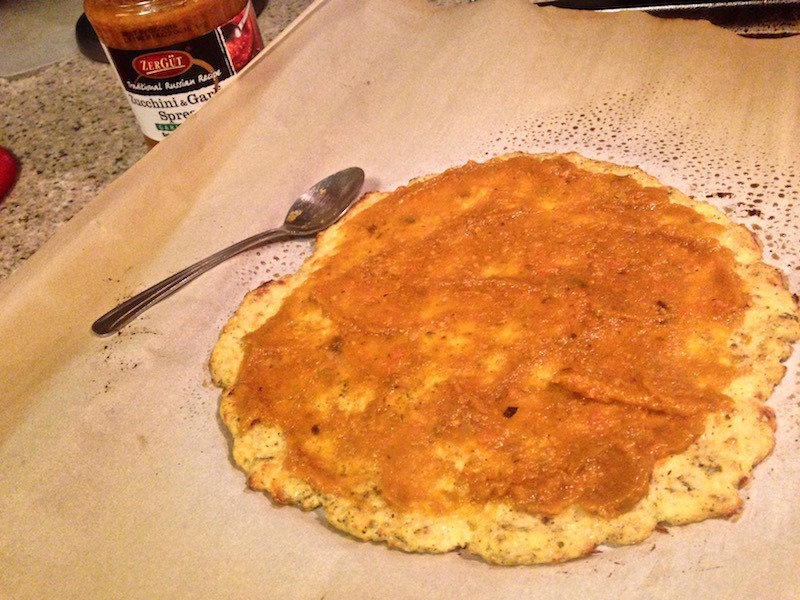 You can use cauliflower to replace all the flour in pizza dough. 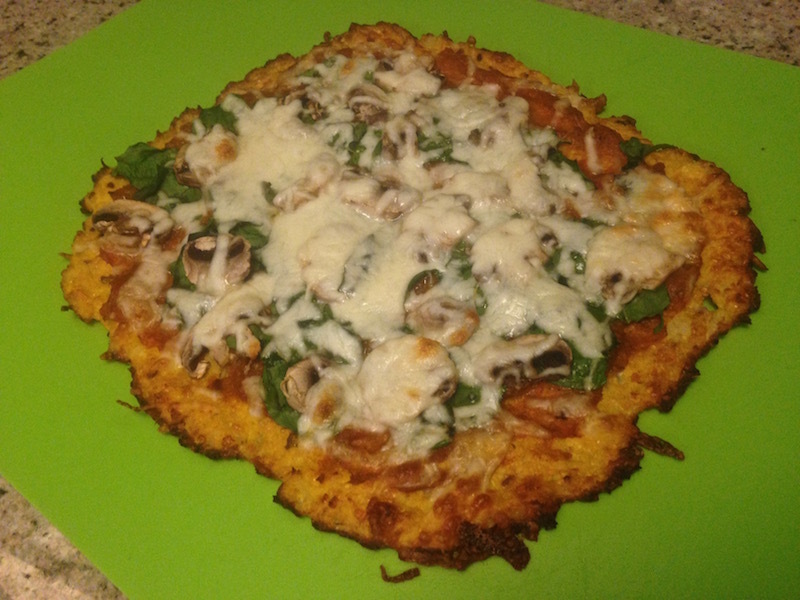 This pizza has almost no carbs, is gluten-free, super-healthy, and best of all, it’s delicious! One of the best things I’ve made in a long long time. Preheat the oven to 425 degrees. Then go to work grating cauliflower on your box grater. (Or use a food processor, if you have one. Go as fine as you can!) 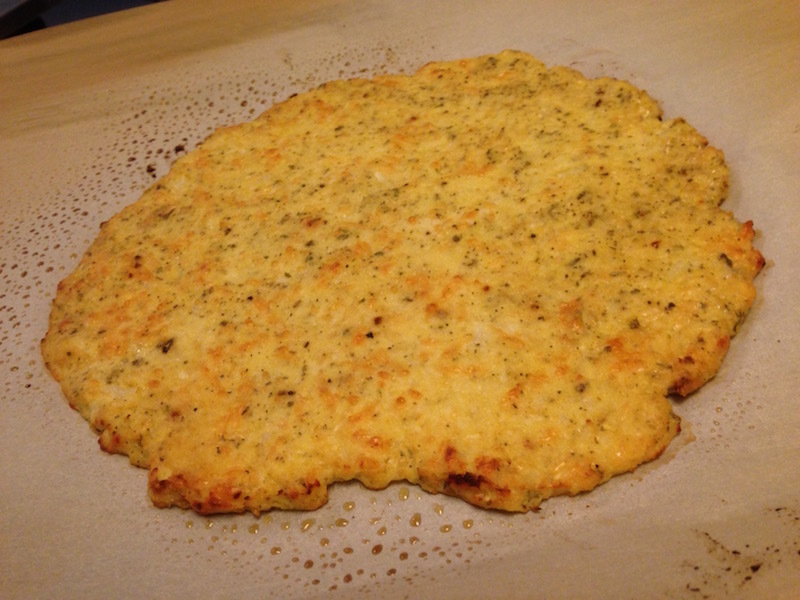 You need 2 cups of grated cauliflower per pizza, which end up being around 10 inches in diameter. 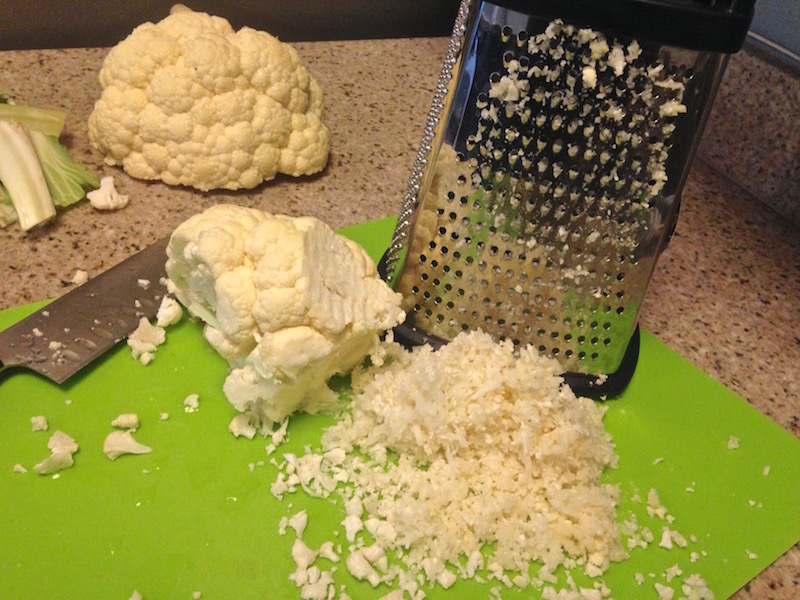 I ended up grating an entire head of cauliflower, and it yielded about 6 cups. I made 2 pizzas, as you’ll see below, and have enough for one more, which I’ll make soon! Trader Joe’s sells bags of ‘riced cauliflower’ – cauliflower pre-grated into rice-sized pieces – so use that if you can and save yourself a lot of effort! RELATED CONTENT: Visit My Recipes Page for Dozens of Healthy Recipes! Microwave the 2 cups for about 6 minutes, until it’s soft and cooked through. Let it cool for a little while, because you’ll be using your hands in a minute, and you don’t want to burn them. 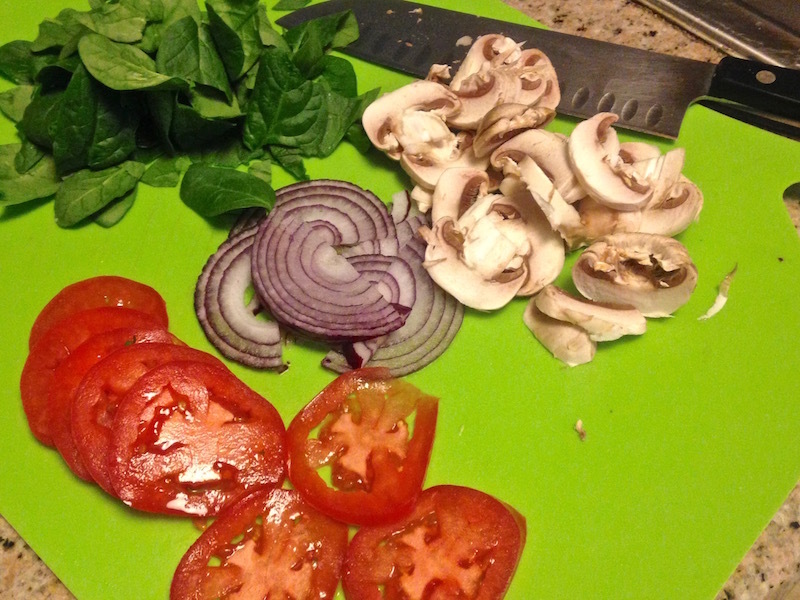 I took this time to slice and prep my pizza toppings. 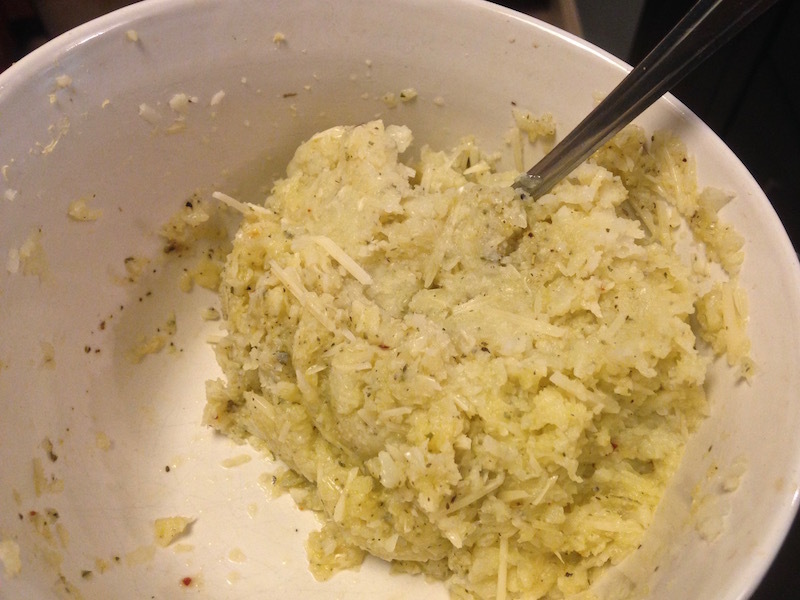 Once the cooked cauliflower has cooled, add in 1 egg, 1/2 cup parmesan cheese, and salt and pepper to taste. These help bind it together, and, sure enough, it starts to come together like a dough. I also added spices. To one dough, I added Italian seasoning, and to the other, I added turmeric, garlic powder, and crushed red pepper flakes. Just a liberal sprinkling of each. Line a baking sheet with parchment paper, and plop the dough in the center, and work it with your fingers until it’s in a thin layer. This dough isn’t going to rise, so spread it until it’s the desired thickness you want. Bake it for 14-16 minutes, until it starts to get golden brown. You can now top it however you want! Here’s what I did. I was wandering an unfamiliar grocery store, and couldn’t find the canned tomato aisle. 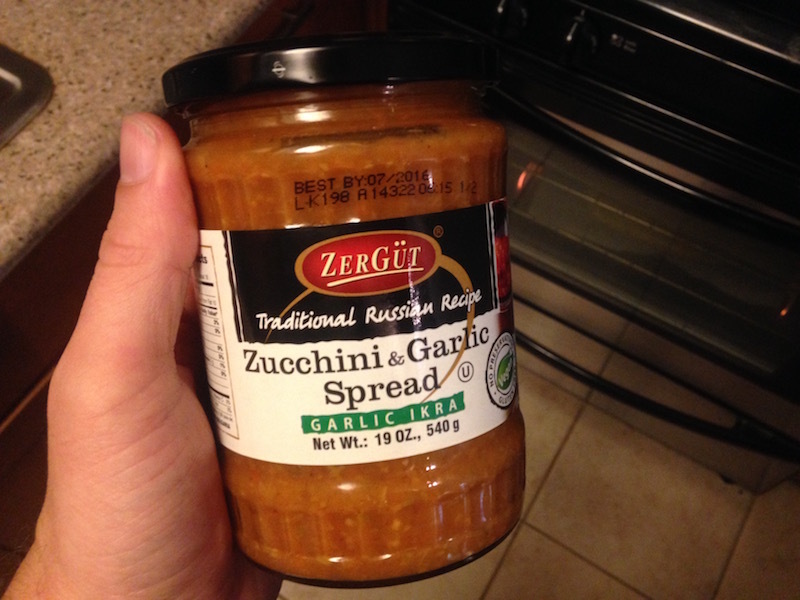 I found myself in the international aisle, and stumbled across this Russian zucchini and garlic spread, and was curious and bought it. It’s a little sweet, very garlicky, and very good. I used a few tablespoons for pizza sauce. 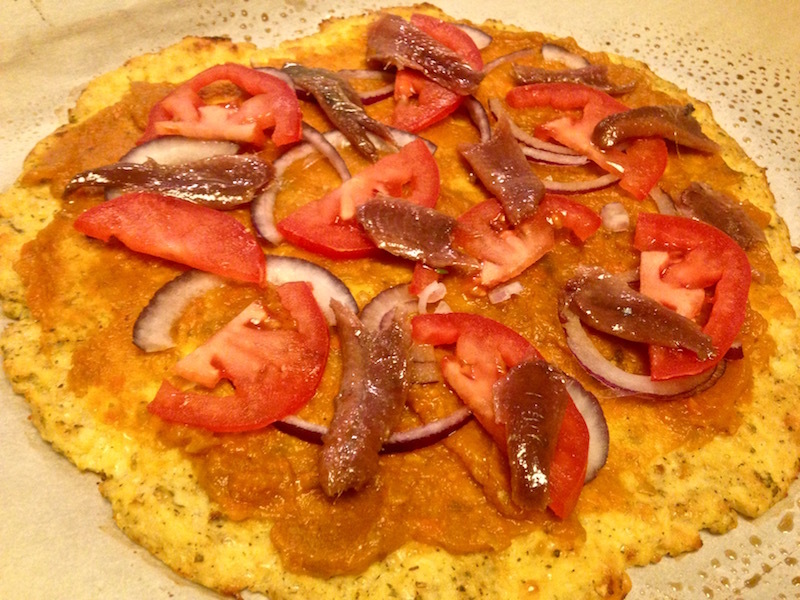 On the crust with Italian seasoning, I piled on tomato, red onion, and anchovy. 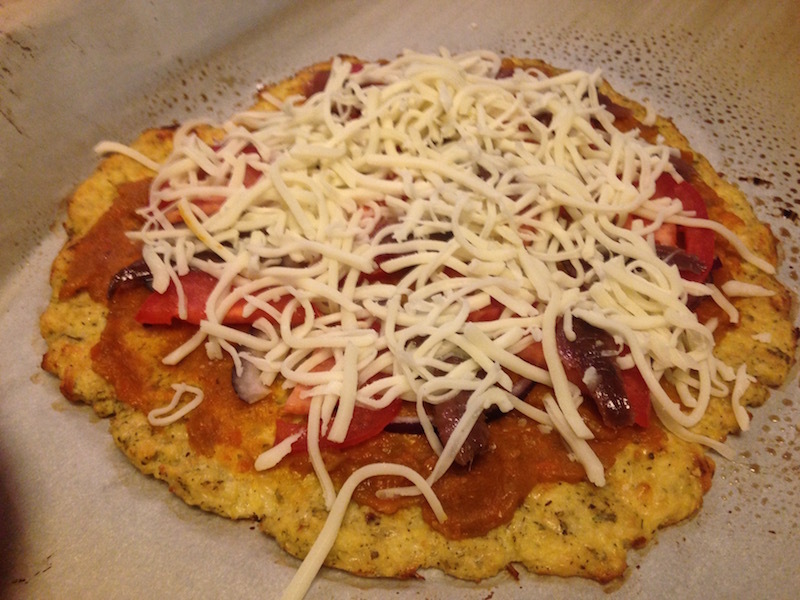 And topped it with mozzarella cheese (probably around 1/2 cup). 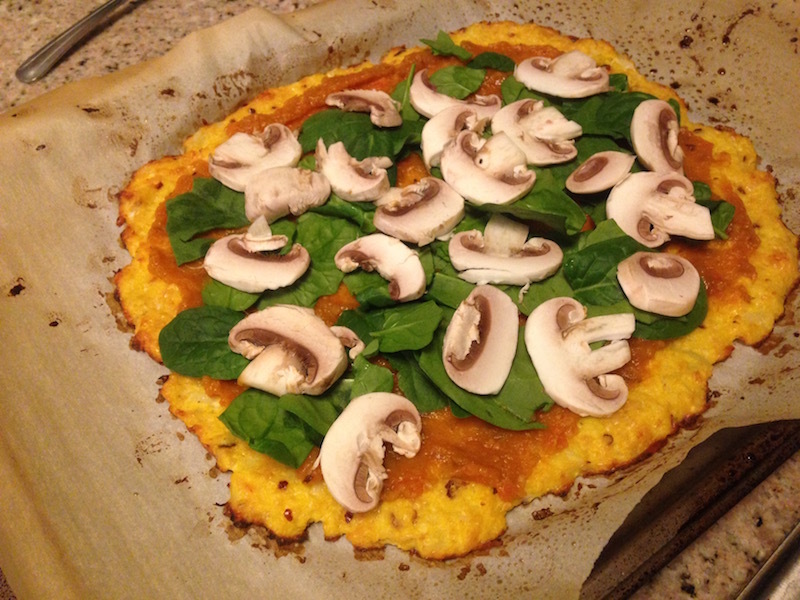 On the crust with turmeric, garlic powder, and crushed red pepper flakes, I added mushrooms and spinach leaves (which I tore into smaller pieces). That, too, got mozzarella cheese on top. They were incredible. The crust held together, and was even pliable, like a pizza crust is. You wouldn’t trick anyone into thinking they were eating a flour-based crust, but it hits that pizza-craving in a completely satisfying way. It has a great texture, crispy edges, mellow flavor that lets the toppings shine, and best of all, it’s completely guilt-free. I’ve already been thinking about what kind of pizza I should make with the rest of that cauliflower. I’m leaning towards sausage and peppers. What are your favorite pizza toppings? This entry was posted on Wednesday, February 3rd, 2016 at 9:40 am and is filed under Uncategorized. You can follow any responses to this entry through the RSS 2.0 feed. You can leave a response, or trackback from your own site. 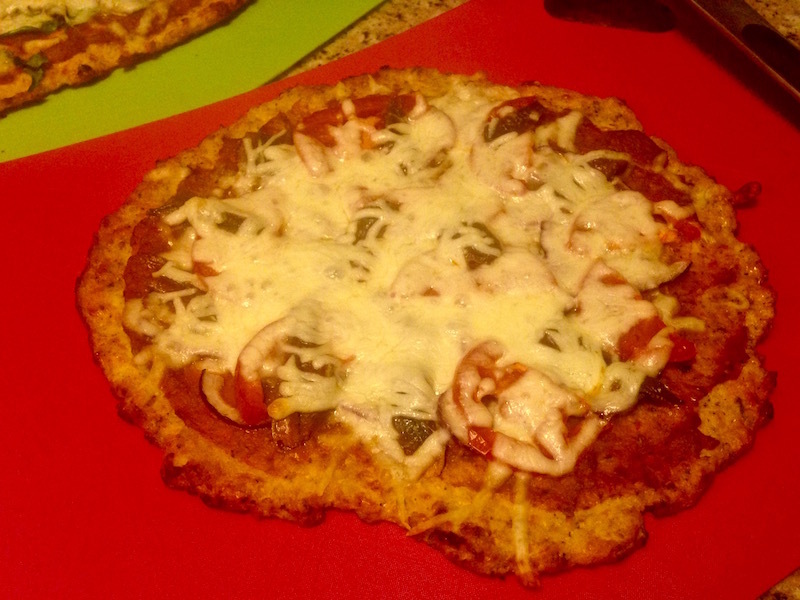 5 Responses to This Cauliflower-Crust Pizza is LOW-CARB. And HEALTHY. And AMAZING. This is brilliant! Will do the same over weekend! This looks so tempting! Have you tried freezing it? I’m thinking this would make a delicious lunch. I will try this recipe. I have not tried freezing. Let me know how that works, if you try it! Excited to try this! I like baking the crust first – tried it once with toppings on from the start and it was too soggy. Cool – hope this way works out better for you, Kelly! See you soon, I hope.